Born in 2007 from the ashes of three underground bands – Yarche-1000-Solnts, DimenticarmiNON!, and Lisichkin Khleb – a Moscow experimental outfit ASIAN WOMEN ON THE TELEPHONE is one of the new Russian avant-garde movement’s most innovative and for a time successful bands… but also perhaps one of its most misunderstood. Their artistic approach draws inspiration from the early Soviet-era Russian Futurism and Dadaism, and echoes a view of society as rigid, absurd, and schematic. They produce the strangest kind of music which collects influences from Kraut Rock, Noise-Rock, Electronics, Free Improvisation, Sound Collage, etc. and channels it into idiosyncratic, sarcastic vision. No overdubbing, no analog mixing or mastering… This is lo-fi music for a low-grade world. In fact, AWOT have never stressed their musical content, regarding music just as an accompaniment to freaky costume-and-masked performances they set. Being banned periodically from Moscow club-venues due to rumored connection to "a mystical ritualistic sect", the band focused on studio work and put out a string of messy recordings with unique packaging (by Maxim Ionov) which were a true labor of love and couldn’t be reproduced in proper manufacturing quantities… Still and all, nothing can be compared to live gigs by AWOTT who is a six-piece ensemble now featuring: Oriental Yid (drums, guitar), Good Enough Freundin (guitar, vocal, drums), Brown Polizei (keyboards, voice, bass), Divine Gift (percussion, voice), Mutter Land (drums, percussion, bass), and Lewd Primat (bass, voice). 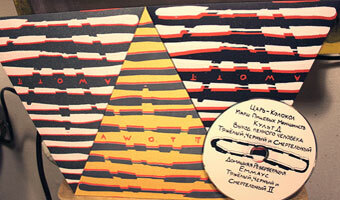 Download AWOTT albums for free through their BandCamp page. "Not an album for those who insist on a melody, and guaranteed to clear the room of late stayers at a party, AWOTT have made a wilfully obtuse album to be filed with your most unpleasant Faust albums. I actually quite like it, but then again I can be a contrary sod!" – by Roger Trenwith at Prog Sphere (Serbia) (August 2011). The album was also reviewed at: Know Your Conjurer (USA), RCRC (USA), Far From Moscow (USA), Not For Resale (UK), Bent Music (Australia), Canili d'Adda (Italy), You People Are Poison (Hungary), iO Pages (The Netherlands). Delicious kraut-n-noise soundtrack to over an hour long theatrical Dada-performance. Limited to 100 pcs: home-made CD-R (1 track – 69 min.) comes inside a hand-made silkscreen quadrant folder (blue-n-red colors over silver cardboard & green-n-black colors over golden cardboard). The third official album by AWOTT. A rare masterpiece of brain-damaged psyche-noise rock! Limited to 100 pcs: home-made CD-R (8 tracks – 64 min.) 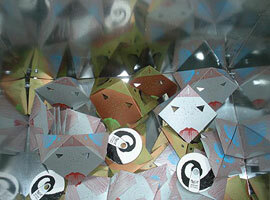 comes inside a hand-made silkscreen triangle folder (various colors). The first ever AWOTT recording. It features rather intentionally primitive low-fi tune-scathes than actual song structures. Recorded at Max Ionov's home studio. Limited to 230 pcs: CD (11 tracks – 32 min.) comes inside a hand-made silkscreen folder (various colors). Rare thing!